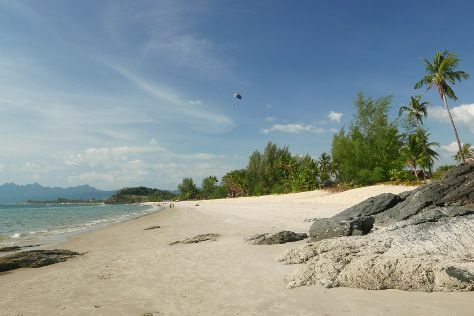 Kick off your visit on the 15th (Thu): zoom along the surf with a waterskiing or jet-skiing adventure, tour the pleasant surroundings at Cenang Beach, and then snap pictures at Langkawi Sky Bridge. Get ready for a full day of sightseeing on the next day: take a peaceful walk through Kilim Karst Geoforest Park and then paddle through the water with a kayaking and canoeing tour. 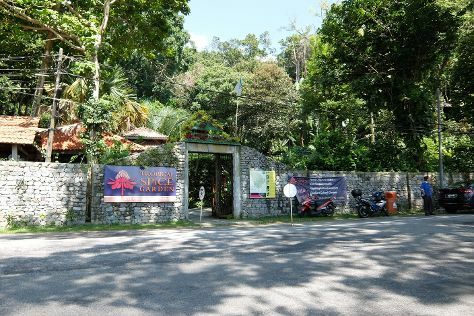 To see photos, traveler tips, other places to visit, and more tourist information, read our Langkawi online road trip planner . Dubai, United Arab Emirates to Langkawi is an approximately 13-hour flight. You can also do a combination of flight and ferry. The time zone difference moving from Gulf Standard Time to Malaysia Time is 4 hours. Prepare for somewhat warmer weather when traveling from Dubai in February: high temperatures in Langkawi hover around 38°C and lows are around 29°C. Wrap up your sightseeing on the 17th (Sat) early enough to travel to George Town. On the 17th (Sat), get engrossed in the history at Pinang Peranakan Mansion, look for gifts at 5.4 North, then examine the collection at Khoo Kongsi, then wander the streets of Chew Jetty, and finally admire the striking features of Kek Lok Si Temple. Get ready for a full day of sightseeing on the 18th (Sun): make a trip to Tanjung Bungah Floating Mosque, stroll through Batu Ferringhi Beach, and then take in nature's colorful creations at Tropical Spice Garden. For maps, traveler tips, reviews, and other tourist information, go to the George Town route maker app . You can do a combination of flight and taxi from Langkawi to George Town in 1.5 hours. Alternatively, you can ride a ferry. You'll gain 1 hour traveling from Langkawi to George Town due to the time zone difference. February in George Town sees daily highs of 38°C and lows of 28°C at night. Finish up your sightseeing early on the 18th (Sun) so you can travel to Melaka. 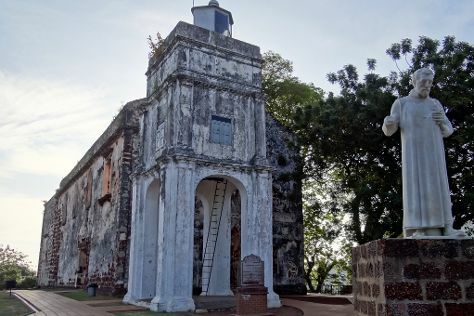 Start off your visit on the 19th (Mon): contemplate the waterfront views at Malacca River, take in the architecture and atmosphere at Christ Church, then don't miss a visit to Red Square (Dutch Square), and finally delve into the distant past at St. Paul's Hill & Church (Bukit St. Paul). Get ready for a full day of sightseeing on the 20th (Tue): don't miss a visit to Jonker Street, don't miss a visit to River Walk, get engrossed in the history at Stadthuys, look for gifts at RazKashmir Crafts, then get engrossed in the history at Baba & Nyonya Heritage Museum, and finally make a trip to The Huskitory. For traveler tips, maps, reviews, and more tourist information, you can read our Melaka road trip planning website . You can fly from George Town to Melaka in 2 hours. Other options are to do a combination of flight and bus; or drive. The time zone difference moving from West Indonesia Time to Malaysia Time is 1 hour. In February, plan for daily highs up to 38°C, and evening lows to 27°C. Finish up your sightseeing early on the 21st (Wed) so you can go by car to Kuala Lumpur. 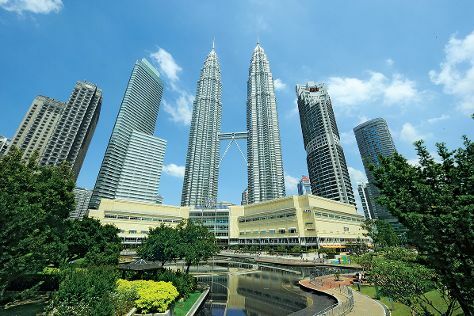 Kuala Lumpur is known for shopping, parks, wildlife, historic sites, and museums. Your plan includes some of its best attractions: admire the landmark architecture of Petronas Twin Towers, admire nature's wide array of creatures at Aquaria KLCC, shop like a local with Chinatown - Kuala Lumpur, and enjoy breathtaking views from Menara Kuala Lumpur. To find out how to plan a trip to Kuala Lumpur, use our trip itinerary maker. Traveling by car from Melaka to Kuala Lumpur takes 1.5 hours. Alternatively, you can take a train; or do a combination of bus and train. In February, daily temperatures in Kuala Lumpur can reach 38°C, while at night they dip to 28°C. Wrap up your sightseeing on the 23rd (Fri) to allow time to travel back home.